Shoplifters are a huge problem in the retail industry. They cause great financial losses for businesses, and many career shoplifters are never caught. Research on this topic, shows that most shoplifters have committed theft over 50 times before they are actually apprehended. Unfortunately, only a very small percentage, on average approximately 10%, of repeat offenders are actually arrested. There are many ways a retailer can reduce their chances of losing money and merchandise to theft, but only a few changes will be truly effective. Here are a few things that retailers can do to minimize and discourage shoplifting, without breaking the bank. Perhaps the best way to deter shoplifters is to install security cameras throughout the storefront. Having security cameras installed inside and outside, will keep shoplifters away, and also protect your business from vandals. It’s a cheap price to pay for the amount of aggravation and money you will save in the long run. 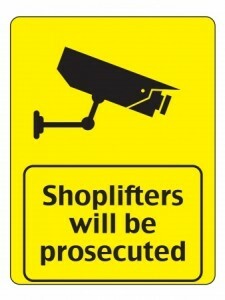 Another way to deter shoplifters is to hire a security guard. The very presence of a guard will discourage shoplifters from making a move on your store. Shoplifters, like many different types of thieves, want to slip in easily, target merchandise, and get out quickly, without having to contend with the eyes of a security guard. Hiring a security guard will even deter shoplifters from entering your store at all, let alone, taking the chance on getting caught in the act. Broken fixtures and missing light bulbs only encourage shoplifters to target your store. Any form of dimmed lighting is never good in a retail environment. Fix all broken fixtures, signs, and replace all defective light bulbs immediately. This is a highly effective and inexpensive practice for any retail business. All popular merchandise should be locked up in cases, or locks should be placed on hangers for clothing. As we stated earlier, shoplifters are attracted to easy targets, and if they have to work harder to steal your merchandise, they will be discouraged from trying. Something as simple as zip tying clothing to a rack can help you with loss prevention. Many times, store managers and owners don’t want to take the time to follow through on prosecuting shoplifters, once caught. They do things like, ban them from the store, or put up pictures of shoplifters to shame them from making another attempt. But we guarantee you, that shoplifters know other shoplifters, and they will spread the word that your business is NOT the business to target, if they know they will go to court for their crime.